If you’ve not been watching ‘reality’/’fly on the wall’ shows (I use the term ridiculously loosely here), such as TOWIE (aka ‘The only way is Essex’), ‘Made in Chelsea’ and more recently ‘Desperate Scousewives’ you may have missed the most recent ‘beauty’ phenomenon, also known as the ‘Scouse brow’. 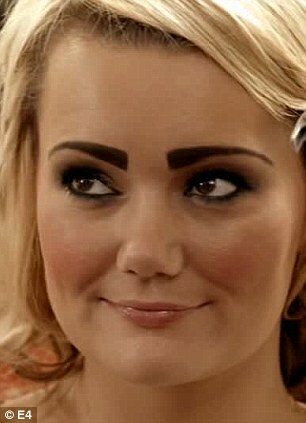 Note the use of an eyebrow pencil to create this delightful look in the very first episode of ‘Desperate Scousewives’. An article in The Telegraph yesterday suggested that there are whispers that Kate Middleton may have had something to do with this look. Far be it from me to judge, but you can read my views on Ms. Middleton’s wedding make up here: http://mbbmore.com/2011/05/04/ms-middletons-brows/. If you read my blog regularly you will know that I have a bit of a thing about brows…if done properly they can make or break a look (see earlier post on Blink Brow Bar: http://mbbmore.com/2011/02/17/hair-removal-part-one/). So, although I am not advocating the above look, done properly the bushy brow can look amazing. If you do, however, have a naturally fuller brow though, this is your time to shine! The trend is for a slighty undefined brow, (think Brooke Shields, as opposed to Tamara Ecclestone) and not to obsess. The more you obsess, the more you are likely to tweeze and draw in, which also means getting away from what is essentially quite an understated and paired down look.